When Roosevelt had left the White House in 1908, he was confident that William H. Taft would be a worthy successor. Roosevelt felt assured that President Taft would continue his policies. Upon leaving the White House, Roosevelt sailed to Europe and Africa. Word soon reached him that Taft was abandoning his progressive policies. By the time 1912 arrived Roosevelt was convinced he needed to return to the White House and replace Taft. 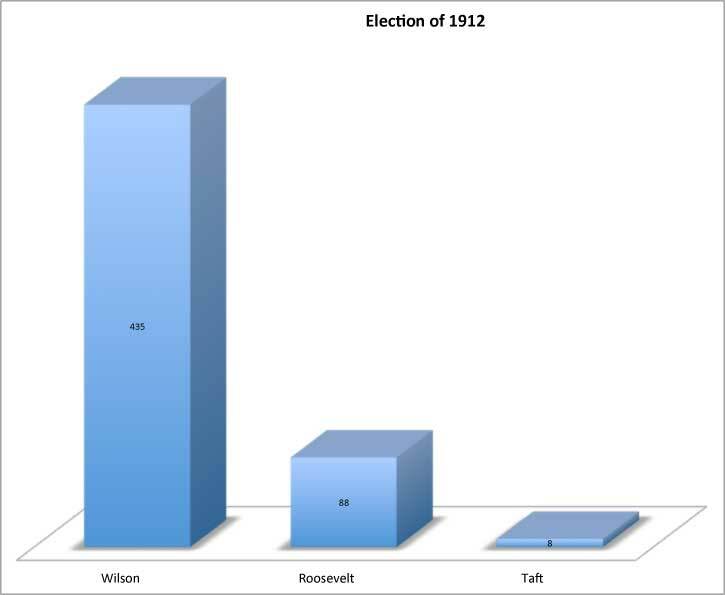 Roosevelt promptly announced that he would seek to take back the Republican nomination from Taft. Theodore Roosevelt competed with Taft for the nomination. Roosevelt won 9 out of the ten primaries by large margins. He even beat Taft in Taft’s home state. Roosevelt’s platform was new nationalism, which included social welfare, direct democracy and federal regulation of business. Roosevelt and his supporters were confident he would win the nomination in Chicago. But the party was controlled by Taft loyalists who steamrolled the convention, insuring that Taft was nominated on the first ballot. Roosevelt then started a new Progressive party to continue his run for the Presidency. The Democrats were now facing a split Republican Party. They knew that if they picked right, they were almost assured the nomination. William Jennings Bryan declined to run. However, Bryan worked very hard behind the scenes to ensure that a progressive was nominated. In the end Bryan supported Wilson, who was nominated on the 46th ballot. 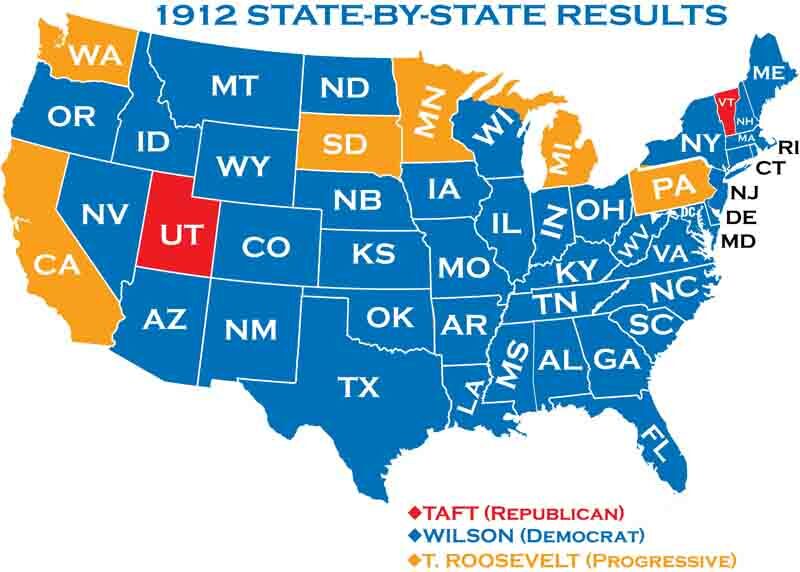 Early in the campaign Taft realized he had no chance of winning. As a result, he stopped making campaign appearance. Theodore Roosevelt and Woodrow Wilson campaigned vigorously. Both were excellent campaigners. The campaign was interrupted when Roosevelt was almost killed by an assassin, on the evening of October 15th. Although he was shot in the chest, Roosevelt insisted on finishing his speech. The bullet was lodged in his rib close to his lung. Out of respect, all of the presidential candidates took a break from campaigning while Roosevelt recovered. 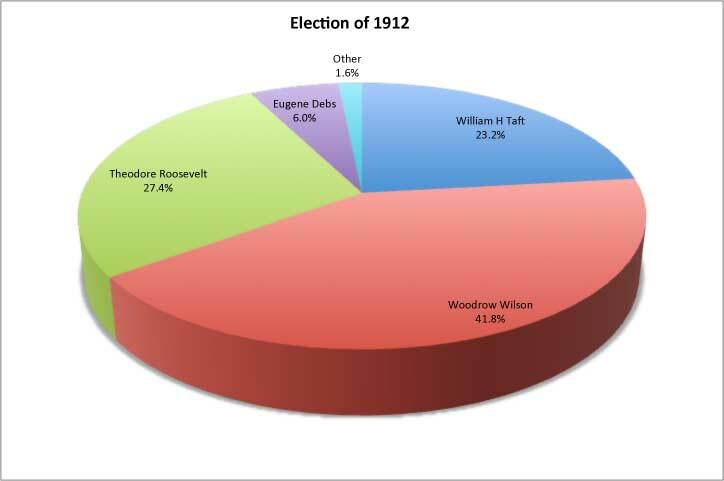 In the end, Woodrow Wilson won the electoral vote by a landslide.